Roula Bechara, a lebanese french artist lives and works in Beirut. She took her masters degree from academie Michel ange des beaux arts. she started exhibiting in 1997 and her work has been featured in numerous solo exhibitions in Beirut, Manama, abu Dhabi, Doha, Dubai and Italy, and was incumbent of Italian artist awards in 2016.
she works on large scale canvases using two mediums oil and acrylic, painting realism and abstract subjects like figures, horses and flowers. a range of colors including fire hues rise to the surface, creating harmonious monochromes melted with gold leaves. in the heart of the canvas, as if emerging from a crack, tender flowers and noble Arabic horses appear. 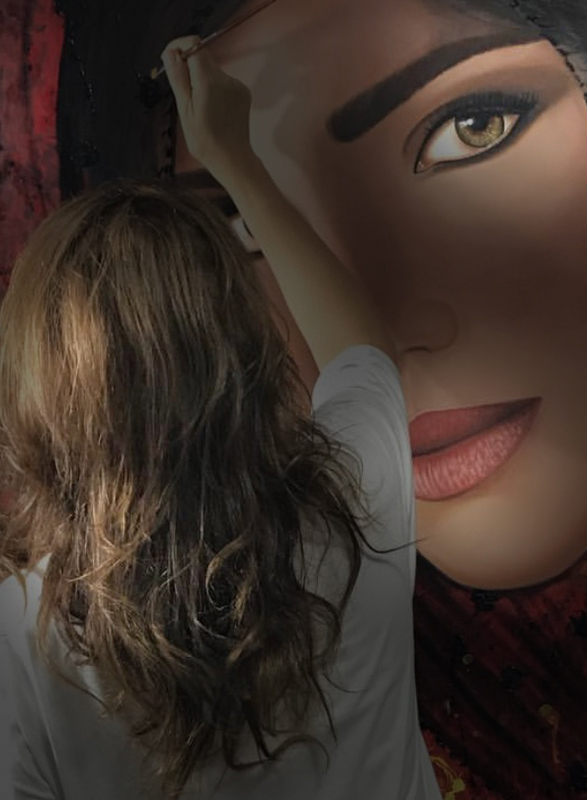 Roula’s art has evolved over time to become more realistic especially with its famous figures mixed with a touch of abstract. “ I CAME TO THE WORLD ONE DAY IN APRIL, IN A WONDERFUL AND TRAGIC CORNER OF THE MEDITERRANEAN IN LEBANON. THESE DAYS IN MY LAND THE SMELL OF FLOWERS WAS OVERWHELMING AND PEOPLE DANCED UNDER A WONDERFUL CLEAR BLUE SKY, UNAWARE OF THE STORM THAT WOULD SOON UPSET EVERYTHING. THAT STORM WAS THE INFAMOUS CIVIL WAR. MY CHILDHOOD AND YOUTH WERE CHARACTERIZED BY THESE EVENTS, BY UNCERTAINTY ABOUT THE FUTURE , TOMORROW WE WOULD ALL STILL BE ALIVE? AND THAT’S HOW I LEARNED EARLY TO ENJOY THE IMPORTANCE OF THE CURRENT MOMENT. WITHIN THIS CONTEXT MY ART WAS BORN, MY DESIRE, MY NEEDS TO PAINT ON CANVAS THE GREAT AND TRAGIC MIXTURE OF EVENTS AND EMOTIONS, WANTING IN SOME WAY TO PORTRAY AND TRANSMIT THE JOY AND THE FEAR, THE MAGIC AND THE TERROR THAT WERE ENGRAVED IN MY SOUL.